Beirut: Syrian troops clashed with army defectors and shelled rebellious districts in the central city of Homs yesterday, killing at least 11 civilians a day after the government claimed it had begun a troop withdrawal ahead of the deadline to implement an international truce plan. Activists said the latest deaths included a man and his son who died in gunfire during fighting in the Qusour district of Homs. They said the renewed violence proved President Bashar Al Assad's regime was not serious about implementing the cease-fire brokered by former UN chief Kofi Annan. Russia, a key ally of Al Assad, warned other nations not to arm the Syrian opposition, saying it would only escalate hostilities. Saudi Arabia and Qatar, have backed the idea of arming the rebels fighting government forces, but the West remains opposed. Western nations, however, did create a multi-million dollar fund for the opposition at a meeting in Istanbul. "Even if they arm the Syrian opposition to the teeth, it won't be able to defeat the Syrian army," Russian Foreign Minister Sergey Lavrov said. "The carnage will go on for many years." Al Assad agreed earlier this week to an April 10 deadline to implement the plan put forward by Annan. It requires regime forces to withdraw from towns and cities and observe a ceasefire. Rebel fighters are to immediately follow by ceasing violence. Opposition activists charged that the regime was racing to crush opponents ahead of the ceasefire deadline by carrying out intense raids, arrests and shelling. A Syrian government official said on Tuesday that troops had already started pulling out of some calm cities, a week ahead of the April 10 deadline. "Forces began withdrawing to outside calm cities and are returning to their bases, while in tense areas, they are pulling out to the outskirts," the government official told The Associated Press in Damascus without saying when the withdrawal began. He spoke on condition of anonymity because he was not authorised to talk to the media. In Homs, a bastion of dissent against Al Assad's regime, opposition figure Mohammad Saleh said a series of loud blasts rattled windows in his home, and heavy machine gun fire was heard across parts of the old city. He said it was not clear what caused the blasts. In recent days, armed defectors known as the Free Syrian Army have taken control of the national hospital in the Jouret Al Shayah district and two other government buildings. 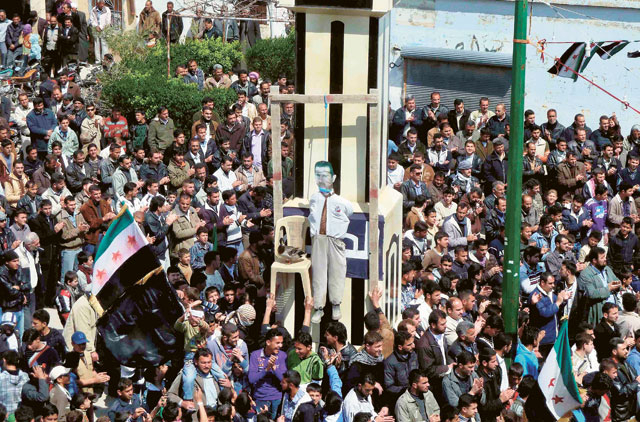 "There is no sign of any withdrawal or calm in Homs," Saleh said. "The situation is just as bad as it has been for the past few months." Amateur videos posted online by activists showed thick flames and black smoke billowing from above what appeared to be a residential building in the Qusour district of Homs. Another video showed a huge fire and explosion behind the minaret of the Dar Al Salam mosque in the Qarabees district. The British-based Syrian Observatory for Human Rights said a man and his son were among seven civilians killed in fighting in Qusour neighbourhood. Three others were killed in shelling of the town of Talbiseh in Homs province and one in Deir Baalba.